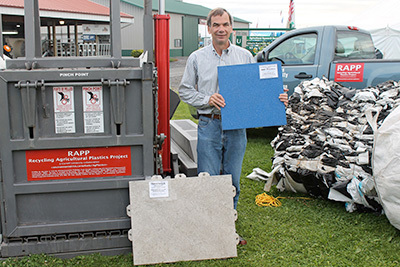 New 6-County Agricultural Plastics Recycling Initiative [Empire Farm Days news release 2015-07-14] – A partnership of Ontario County, Casella Resource Solutions, and Cornell Cooperative Extension of Ontario County is looking to divert farm plastic waste material away from the regional landfill in Ontario County to recycling opportunities. Recycling plastics can save farm and business owners landfill and dumpster fees of $70 or more per ton and removing farm plastics from the waste stream extends the life of landfill space. The program also serves farmers in Livingston, Monroe, Seneca, Wayne and Yates counties. Read the full release. Cornell team readies for national ‘Weed Olympics’ July 21 [Cornell Chronicle 2015-07-15] – After enduring practice through thistle and flashcards, the Cornell University Weed Team will send four graduate students and seven undergraduates for two days of agronomic combat at the 2015 National Collegiate Weed competition – affectionately dubbed the “Weed Olympics.” The contest will be held at Ohio State University’s Agricultural Research and Development Center at South Charleston, Ohio, July 21-22. Horticulture graduate student Vinay Bhaskar is among the students representing Cornell under the tutelage of Antonio DiTommaso, professor in the Soil and Crop Sciences Section, School of Integrative Plant Science. Read the whole article. Stopping Pests Earns Greenhouse Pro ‘Excellence in IPM’ Award [NYSIPM Program news release 2015-07-16] – : Nora Catlin, floriculture specialist at Cornell Cooperative Extension of Suffolk County, has received an “Excellence in IPM” award from the New York State Integrated Pest Management Program (NYS IPM). The award honors Catlin for her work with commercial greenhouse growers who, on Long Island alone, contribute nearly $80 million to New York’s economy. Catlin received her award at the Long Island Horticultural Research and Extension Center’s Plant Science Day on July 15. Read the full release.